John Milton (1608-1674) was blind when he completed the text of Paradise Lost. Over the years, scribal and transmission errors, variant spellings, punctuation, capitalizations, and additions have cast doubt on the text’s reliability. By modernizing the text, reducing inconsistencies, and applying judicious attention to various words and phrases, John T. Shawcross has provided a new and ‘definitive’ edition for Milton scholars. In printing this edition, Andrew Hoyem (of Arion Press) pays tribute to the John Baskerville edition of 1759, and the second edition of Paradise Lost of 1674, the year that Milton died. This was when the poem was divided into 12 books. 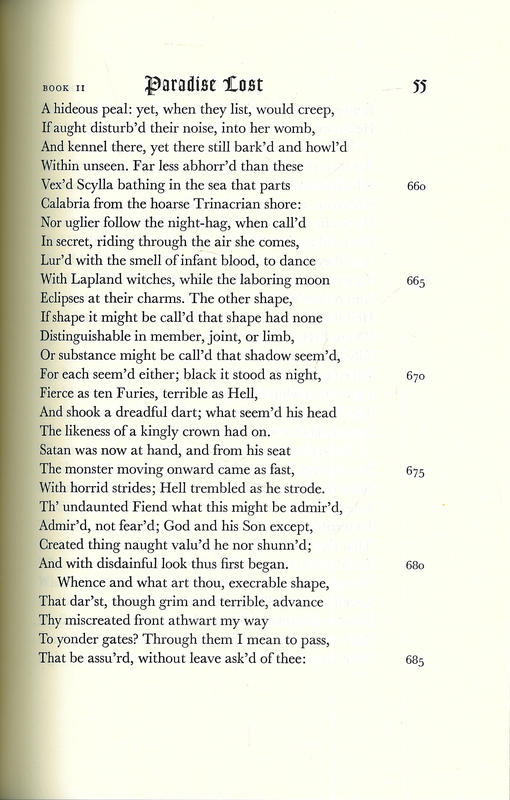 Here is a portion of the text that provided Blake with the inspiration to produce his Satan, Sin, and Death image. John Milton, “Paradise Lost: a Poem in Twelve Books,” ourheritage.ac.nz | OUR Heritage, accessed April 22, 2019, http://otago.ourheritage.ac.nz/items/show/8311.